Our engineering staff has been supplying and technically supporting the O.E. and aftermarket Starter Drive Component market with high quality gears, clutch shells and extruded commutators, for the past 35 years. 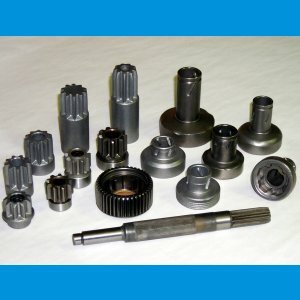 We have recently developed the technology to produce armature shafts with formed gears. We can supply you with a blank or finish the component complete ready for assembly. Manufacturing includes extruding, upsetting, forming, Helical splining, machining, grinding and sub assembly of the bushing. All heat treatment is completed and certified at an outside qualified supplier.